I have FOUR new paintings to show you (wow, I have been busy!). "Alice in the Starry Night" , "Faces of Faery 231" , "Poissons Volants: Les Poissons Bleus" , and "Poisonous Beauties XIV: Mandrake Root". Whew! All of them are now up at Strangeling.com as prints & canvases. Enjoy! "Alice in the Starry Night"
"Alice in the Starry Night" - part of my very exciting and in-depth "Alice in Other Lands" series that combines Alice in Wonderland with Art History! This piece of course showcases Vincent Van Gogh's "The Starry Night" from 1889. I had so much fun on this one, incorporating Van Gogh's style and colours with my own - you may notice the tips of Alice's strands of hair slowly changing into the starry night behind her... The original acrylic painting has sold, but we do have prints & canvases available now worldwide. 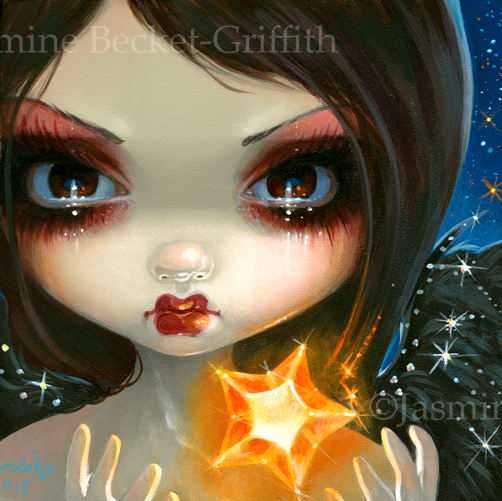 "Alice in the Starry Night" Glossy paper prints (signed on the back by me) are $29.99here - and we also have the Open Edition remarqued canvases popping up there too. Just select either the paper print or the open edition canvase print option in the Fine Art Prints options dropdown box. The limited edition canvases are already almost SOLD OUT. I have only ONE left right here before the final #25/25 Limited Edition Canvas is auctioned off. Yes, this was INSANELY fast, the fastest I've ever had an edition sell out. I am sorry they sold out so fast! Other than that one left on eBay (before the #25 is auctioned), I will also have one of them at Dragon*Con this autumn. The next best thing are the open edition canvases, also $125, which will pop up any moment at Strangeling.com here under the fine art print options. Larger open edition canvases (up to 40" wide) will be available shortly from Pop Gallery Orlando. 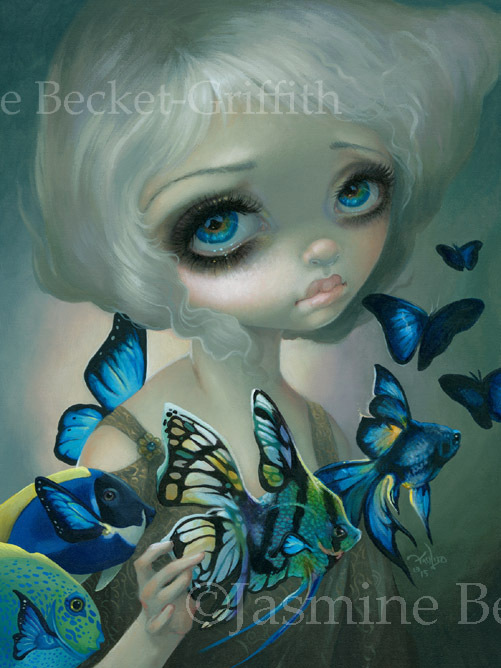 Click HERE to see the other paintings in my Alice series! "Poissons Volants: Les Poissons Bleus"
Just choose your print option - $13.99 for 8x10" glossy paper prints, $29.99 for 12x16" glossy paper prints (both sizes signed on the back by me), or also we have the 11x14" Limited Edition canvas prints - those are $125 and are each hand embellished by me in acrylic paints, signed, dated & numbered out of only 25 ever made. The canvases are already wrapped on boards and ready to hang immediately on your wall. This is the 231st installment (that is a lot!!) of paintings in my Faces of Faery series. They are all 6x6 squares and are made to hang in groups! Definitely check out the rest of the Faces of Faery series here! 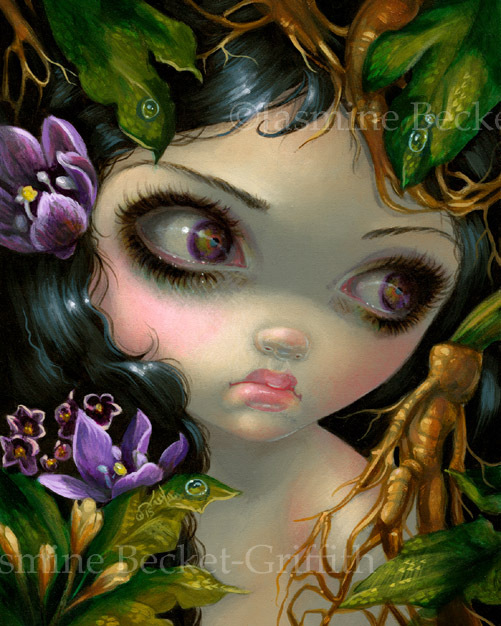 "Poisonous Beauties XIV: Mandrake Root"
The fourteenth installment in my Poisonous Beauties series – a series of works featuring portraits of faery creatures and various poisonous plants! #14 in this series features the mandrake root – the source of a lot of magic and folklore (used in spells, curses, herbal remedies – all very eyecatching since the root looks rather like a human form!). And they’re apparently a bit poisonous, too!